Thick and chewy Chocolate Chocolate-Chip Walnut Cookies have crispy edges, a soft almost brownie-like middle, and are loaded with big chunks of walnuts. We’ve talked about this before, but it’s worth mentioning again. I think it’s really hard to have too much chocolate in a baked good. Sauce is another story but chocolate and chocolate baked together works for me. When you throw in a good walnut or pecan, well there isn’t must else that can beat it. 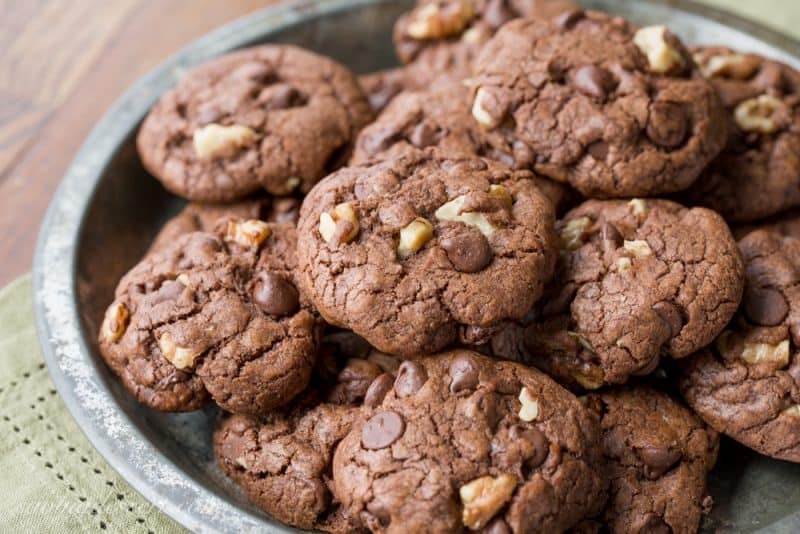 These cookies are absolutely for the chocolate lover, but also for the cookie connoisseur. The texture is exceptional with a thin crispy crust and a brownie-like soft middle. I love a thick cookie and this one delivers. My husband often reminds me that he wouldn’t mind if I made cookies more often. Chocolate is not his first choice but he loved them too. You know we can’t eat all these desserts by ourselves so we are blessed with taste-testers that are happy to help. Family first, then my husband’s office and then neighbors. Our dedicated taste-testers were thrilled with the cookies and asked when I was going to post the recipe. 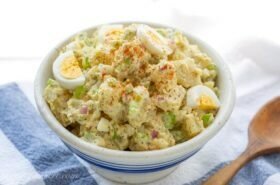 You’re all going to love this one because it’s easy, and fool-proof and one of my favorites! Fresh from the oven … these are heavenly. Warm and soft, it’s almost worth burning the roof of your mouth with a molten chocolate chip! However there may be a time you’re not be in the mood to bake and turn on the oven, but you can still enjoy chocolate chip stuffed cookies like these No Bake Chocolate Chip Cookie Dough Bars. Bake or no-bake, cookies rule! The dough is easily made ahead and refrigerated for up to two days. Or roll the dough into balls and flash-freeze for longer storage. When company pops in or when you’ve gotta have something chocolaty and sweet, you’ll have cookie dough ready to go! You may need to add a few extra minutes to the baking time, but these cookies are best slightly under-baked for that soft fudgy middle. Milk adds another dimension to these crazy good cookies. 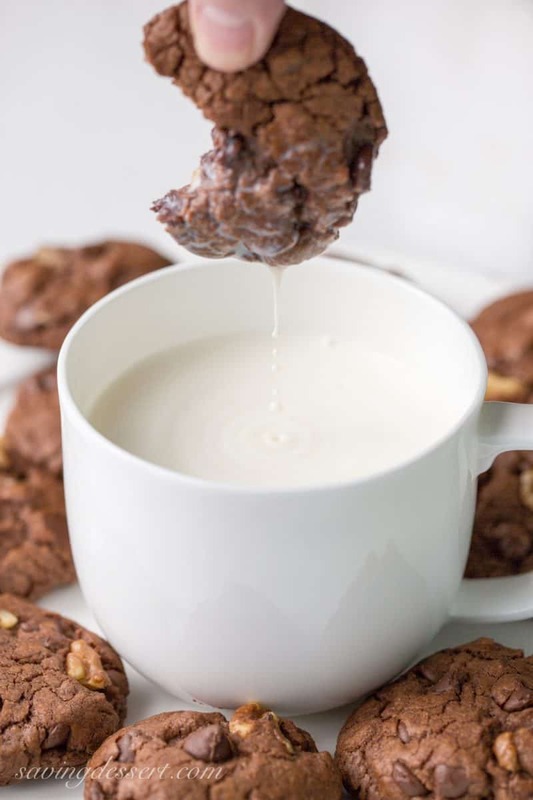 Warm cookies and milk – what a treat! Don’t forget to PIN to your favorite chocolate board! A rich chocolate cookie stuffed full of walnuts and semi-sweet chocolate chips, with a light crispy crust and a soft fudgy middle. Serve with milk for dunking for a special treat! In a small mixing bowl whisk together the flour, cocoa powder, baking soda and salt. Set aside. In a large mixing bowl combine the butter and sugars and mix until smooth. Add the espresso powder, egg, egg yolk and vanilla and mix until combined. With the mixer on low, gradually add the flour mixture to the sugar mixture. Once combined, beat on medium for 20-30 seconds, scraping down the sides of the bowl as needed. Add the walnuts and chocolate chips and stir with a wooden spoon until incorporated. Roll 2 tablespoons of dough into a ball and place on the parchment lined baking sheet. Repeat with remaining dough and space each dough ball at least 2-inches apart. Gently press down on the dough ball to flatten slightly, leaving them thick. The dough does not spread a great deal and if left in a ball, it will bake into a ball. Bake until the edges are set but the middle is still soft, about 15-18 minutes. Allow cookies to cool on a wire rack. The cookie dough does not spread a great deal when baked. Press down on the dough balls lightly to flatten a little before baking. The cookies are best when slightly under-baked. 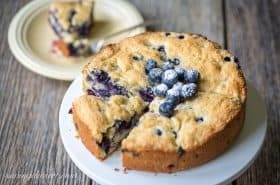 Remove from the oven when the edges are set and the middle is puffy and soft. 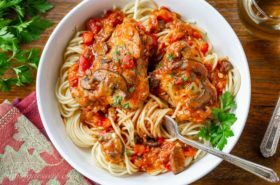 Dough balls may be frozen then stored in an airtight container. When baking a frozen cookie dough ball, add an extra minute or two to the baking time. Store cookies in an airtight container with a slice of sandwich bread to retain the soft texture. 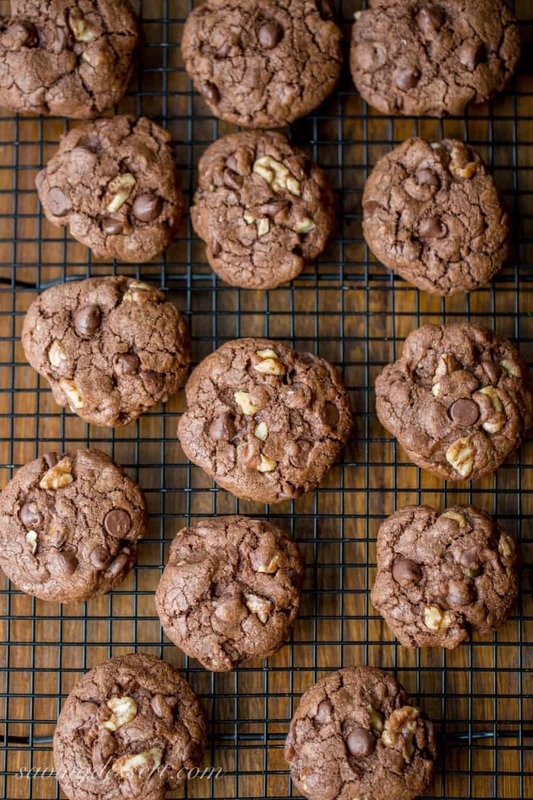 If you love a great chocolate cookie, you might like these recipes too! Here are some of my favorite baking tools for the kitchen – each photo is clickable! There you have it. Another weekend has slipped away and the to-do list is still just as long as it was on Friday! Oh well, at least we don’t get bored around here 🙂 I hope you had a good weekend and hope you have a wonderful week. Thanks so much for stopping by! Thanks a lot for the recipe. Taste so good! 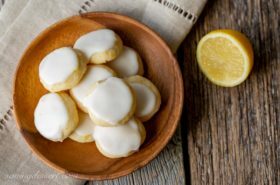 Thanks for trying it Dila – I love these cookies and they’re so easy to make too. We LOVE feedback so thanks so much! Can you use pecans instead of walnuts?? Sure I think that will be fine! Hi Amalia! Hope you’re doing great. Thanks for stopping by. Cocoa powder really is the way to go in baking, I think. Sure you want chocolate too, but cocoa powder has better depth of flavor, at least IMO. Anyway, great cookies! I’d love to be one of your taste testers! Thanks John! I always buy the best cocoa powder I can find too – love it! My grandsons won’t eat nuts in cookies yet but I certainly will 🙂 I bake a batch for them and then add the nuts and bake the rest for the adults. 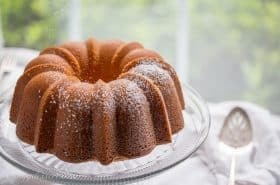 Your description and photos make me want to bake these today! Oh those boys don’t know what they’re missing! At least if you bake two batches, some with and some without – at least you know there will be cookies left for you!. These are great cookies and were well received by my taste testers. Hope you give them a try! These have to be the perfect cookie Trisha, I’m a big cookie dunker. These are great for dunking Cheri! Have a wonderful week and thanks for stopping by. My Littles would love these..every time I happen to see where you are from..it reminds me that we drive past or through your town..such prettyvistas..w/ the horse properties etc.. I bet your hardworking football playing littles would enjoy these after a good game! Fredericksburg is very picturesque, especially on the drive between our house and Charlottesville. So many gorgeous horse farms, many that have been there since the late 1700’s. Amazing history is our area for sure. I am pinning these and making them soon. A crispy crust and soft chewy center does it for me. Be sure to have some friends around so you can share these Gerlinde – they are addictive! Thanks so much for stopping by. Love the milk dipping pictures. Exactly what I’d like to do with big stack of these yummy looking cookies. I know they’re impossible to resist fresh out of the oven! 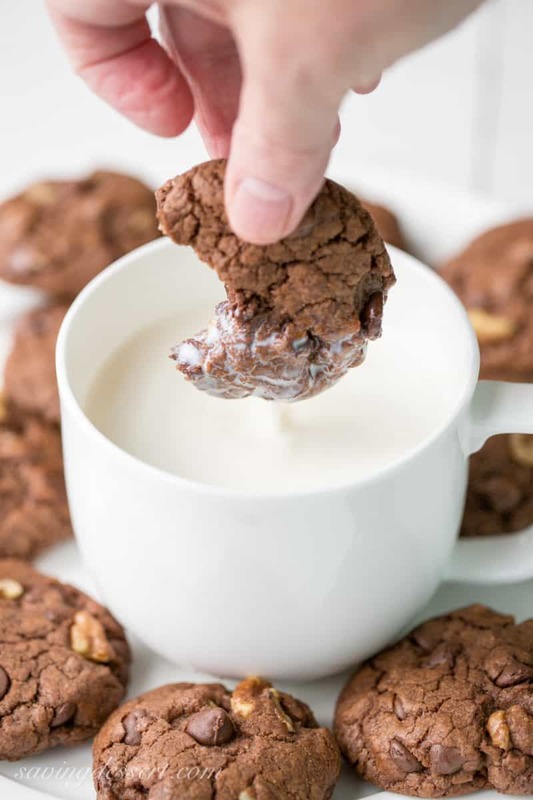 These cookies are perfect with a glass of milk Chris – thanks so much and have a wonderful week. You’re right Jennifer! Chocolate is always the popular choice. Thanks! Thank you Sue! I love walnut too – even more than pecans 🙂 Have a wonderful week. You’ve made some wonderful looking chocolate cookies and I think you would love these too. We do love our chocolate Monica! Have a wonderful week! 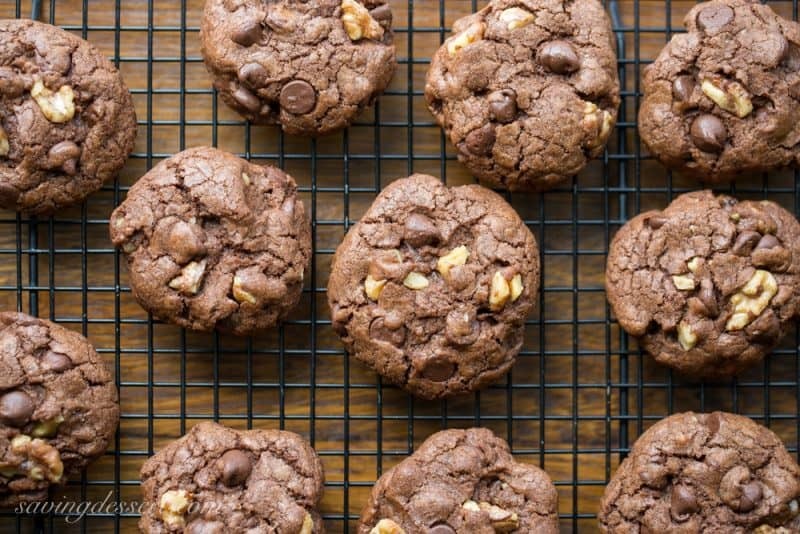 Crisp edges and soft brownie-like center…you just described the perfect chocolate cookies, Tricia. Thank Angie – have a lovely week!